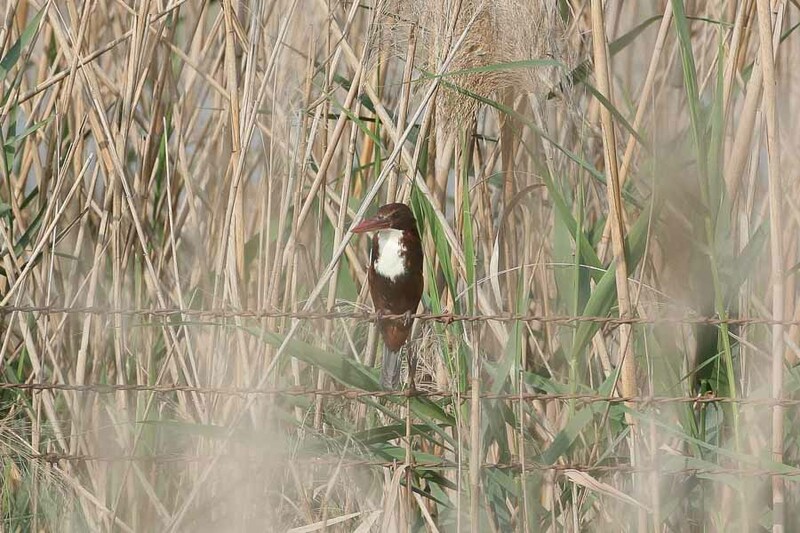 Whilst birding Sabkhat Al Fasl 31 August 2013 with Phil Roberts we found an adult White-throated Kingfisher Halcyon smyrnensis sitting on a reed stem at the edge of the main reed beds. Unfortunately the bird flew off and into the reed beds before any pictures could be taken. White-throated Kingfisher was classed as a vagrant to the Eastern Province of Saudi Arabia (Bundy et al 1989) with two records one at Dhahran 4-5 October 1984 and one overwintering at the Dhahran Hills percolation pond early November 1985 until March 1986. Since then Phil Roberts has had two records at Sabkhat Al Fasl, one in November 2006 and one 21 August, 4 September & 18 September 2009. At Sabkhat Al Fasl the species was seen at each visit in August 2006 with probably 10-15 birds present with breeding thought likely to be confirmed at the site in due course (Jennings 2010). One was in Dhahran in December 2008 with other records from Dhahran Hills Park. However, since these records the species has become rare in the Eastern Province and breeding has not occurred. The photograph below was taken by Phil Roberts at Sabkhat Al Fasl and is used with his kind permission. 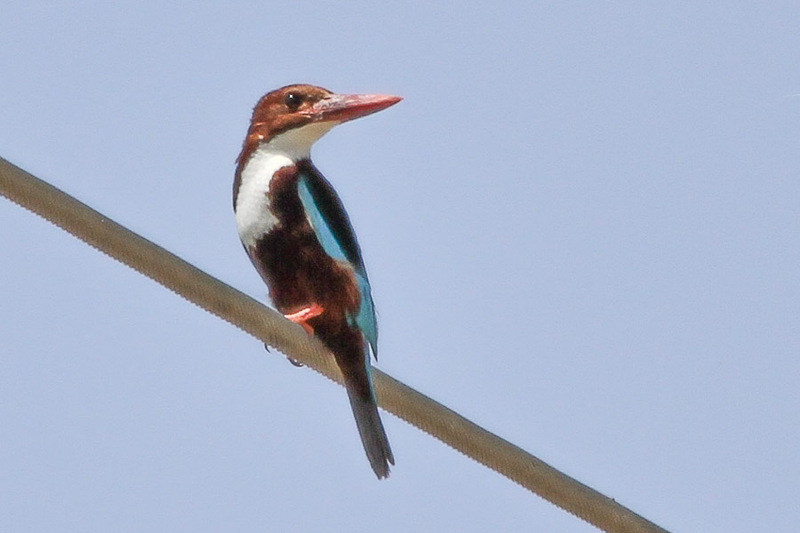 In Arabia the White-throated Kingfisher is primarily a scarce winter visitor to northern and eastern areas which are thought to be individuals originating from the Tigris and Euphrates valleys in Iraq and from coastal Iran. Records away from their breeding areas are unusual as the species is basically resident throughout its range although individuals wander to a certain extent outside the breeding season and there is some evidence of southward movement in Iraq in autumn. Breeding has been confirmed in the last couple of years at the Riyadh River south of Riyadh where birds can be seen at any time of year normally near water where fish are present. They have, however, also been seen at pivot irrigation fields often sitting on the spray bars. The photograph above was taken my Mansur Al Fahad at the Riyadh River in late April 2013 and is used with his kind permission. As birds now breed in Kuwait and the Riyadh area of Saudi Arabia there is a possibility the species is increasing it range in a southwards direction? Kuwait - Uncommon winter visitor and scarce resident that also breeds. There were counts of five on several dates in May 2001. Saudi Arabia – Vagrant to the Eastern Province. Resident breeder in the Riyadh Area. United Arab Emirates - Vagrant with eleven records of twelve birds. Two Ramtha Rubbish Tip 30 Nov 1990 with one 28 Aug 1992-7 Feb 1993. One Dhayah 28 Dec 1995 with another 17-23 Jan 1998. One Ra’s al-Khaimah Khor 23 Oct 1998. One near Khatt Lake 7 Mar 1999. One Ra’s al-Khaimah Airport 6 Nov 2001. One Khor Kalba 20 Feb 2009. One Al Mamzar Park 4 Mar 2011. One Wamm Farms 5-30 Nov 2011. One Jebel Dhanna--hotels 1 Apr 2012. Oman- Rare & highly localised breeding resident.